When last I wrote, Zack was having issues with his epidural. He was complaining of his back being wet and when we checked him we found a big blood stain under his body. That will get your adrenaline going! The pain management team came up and decided that it was “old” blood (as if that makes parents feel better) and that all was good. It was soon evident that the epidural was not covering his pain. He needed consistently more pain meds at closer together intervals. After another visit from the pain team, it was decided that the epidural was no longer viable and it was disconnected. Sadly. Zack was then given a Morphine PCA (patient controlled analgesia) and we set off on our all-nighter. That’s right, our little cherub was up the entire night. He just could not get comfortable and only slept in 10 minute increments. It was getting a little dicey by the end, but our nurse and charge nurse finally convinced the on-call pain people that Zack required more/different drugs. At 5 a.m. we were finally able to make the switch from Morphine to Dilaudid and Zack began doing much better. He dozed off and on most of the day and looked pretty tired when I left him tonight. Jim is hoping that Z continues to sleep tonight with minimal pain….we shall see. Another frequent Zack issue is retaining urine. This morning when his surgeon came in he had a dome-like swelling in his lower abdomen. It did not look like the distention he gets when obstructed and the nurses were not overly concerned, but it looked strange to me. His surgeon said that it was not normal and that she felt it was his bladder distending. 550 ml later, with a flat stomach, Zack felt much better. His catheter has not been overly effective at draining his urine. We think this is partly due to his positioning and lack of movement. We are hopeful it will improve as he begins to move more. The catheter will remain in for another few days. When Zack has pain, he does not like his bed or body to be touched. No hugs, no snuggles, nothing resting on his bed or anywhere he might feel the slightest pressure. He is still very much in the no touching mode, but did ask me if we could snuggle by holding hands as he slept. Baby steps…. We are eagerly awaiting bowel sounds in his abdomen. The average wait for these to return after surgery like Zack’s is 4-5 days. We are hoping Zack will be an overachiever and go for 3 days. Here’s hoping. No pressure. Once those bowel sounds return, he can begin a diet of clear foods like jello, juice and broth. He hopes that will happen soon as well! Here at Cincinnati Children’s Hospital they are at an all time high census. There are so many kids here that the hospital has begun sending kids elsewhere. From what we have been told, this has not happened before. Nurses and other staff are being offered bonus pay to come in to help. Some short-term surgical cases are having to spend the night in the recovery room rather than patient rooms. It is a bit crazy. Because of the crazy amount of kids here, the Ronald McDonald House is also really crowded. We had hoped to be able to stay there once Zack is released as we will be here another week. The Ronald McDonald House has so much more to offer Zack during our week of bowel management training. From playgrounds, to being across the street from the hospital, to other kids, it just felt like a better fit. Sadly, we are not sure if we will make it in at this time. Happily, we DO have reservations at a hotel, so even when Jim leaves us to go back to work, Zack and I have a place to stay. At any rate, things are going according to plan. Zack is feeling better today than yesterday. Hopefully tomorrow will be more of the same. Resting and healing are Zack’s biggest tasks at the moment and he is doing an awesome job AND being super brave. Until next time…. 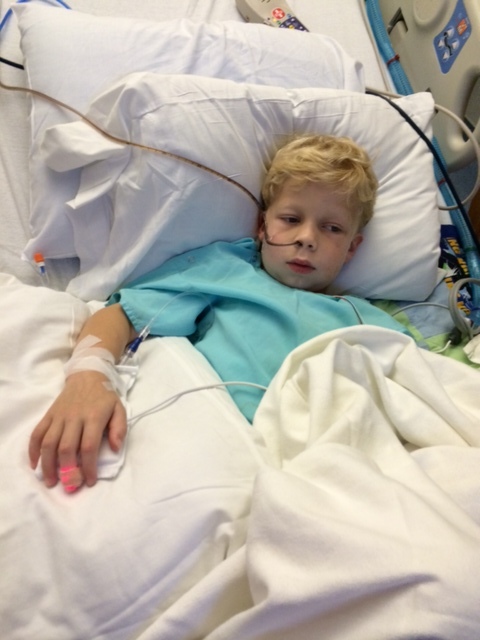 This entry was posted in Cincinnati Children's Hospital, Surgery by Dawn Penrod. Bookmark the permalink.